"A REUNION OF BODYBUILDING GREATS HONOURING WAYNE GALLASCH OF GMV PRODUCTIONS"
Disc #1 is also available as a DIGITAL DOWNLOAD running 85 mins. 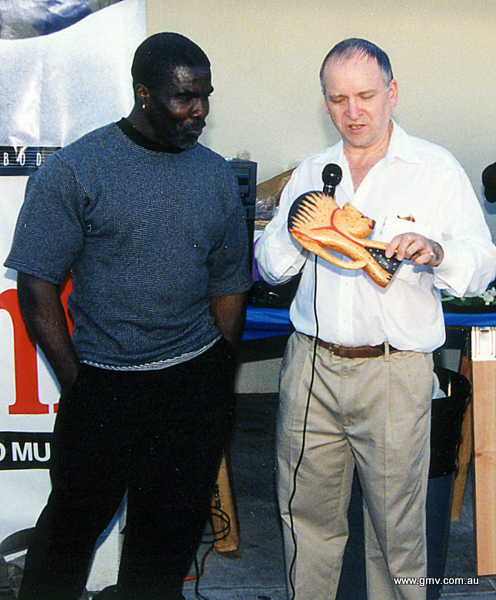 This wonderful event was held at the World Gym Corporate Headquarters, Marina del Rey, California on October 25th, 2000. Legendary Gene Mozée was the MC as he introduced some of the great legends of the Iron Game. This was a rare celebration and opportunity for Bill Comstock to gather together Wayne’s friends and associates in celebration of the legends and immortals of bodybuilding, thanks also to the kindness of Joe Gold. Champions such as LARRY SCOTT, LOU FERRIGNO, DAVE DRAPER, TOM PLATZ, MICKEY HARGITAY, ED FURY, BOB PARIS, ZABO, JOE GOLD, ROBBY ROBINSON, BRAD HARRIS, ERNIE SANTIAGO, CLINT BEYERLE and AL BECKLES - attended, to name just a few. Every attendee is listed in the DVD and many are interviewed by Wayne or Gene. Wayne has been a pioneer of bodybuilding films and videos from his first stills in the mid 1960s to the present day. Robby Robinson created a special cat sculpture which he presented to Wayne. (See photo below.) Dave Draper also presented Wayne with a copy of his brand new book "Brother Iron, Sister Steel: A Bodybuilder's Book." REMEMBERING JOE GOLD - click here for the tribute to Joe Gold by Wayne Gallasch. We include our complete and extensive collection of REUNION PHOTOS taken by Jerry Fredrick, Clive Jaques and Wayne Gallasch. As far as we can tell, every single attendee is included at least once in the photos! 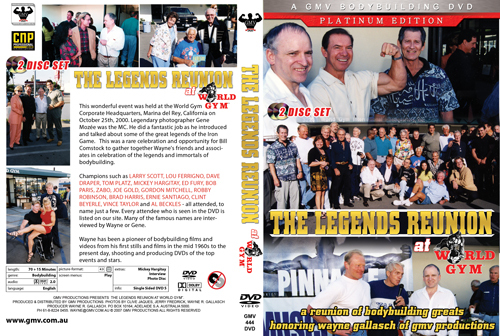 Disc #1 is the complete Reunion video on DVD. Reunion running time: 70 minutes plus extra scene 15 minutes. Disc #2 is a 417 pix PHOTO DVD which runs 33 minutes as a slide show. Part of the crowd who attended. Photo by Clive Jaques. Special thanks also to Jerry Fredrick who took many photos for me. The Photo Gallery in the DVD includes photos showing every single person who attended with photos by Fredrick and Jaques. Also my thanks to JOE GOLD for allowing me to hold my reunion at his WORLD GYM. See Joe right of center, blue World Gym T-shirt. See Wayne's ERNIE SANTIAGO PHOTO GALLERY. See Wayne's photos of Tom Platz in the TOM PLATZ PHOTO GALLERY. Read Wayne's Hard News Reunion Report from this event which includes a complete list of attendees and links to the various DVDs they appear in, click here. The WORLD GYM LEGENDS REUNION REPORT by Dave Draper's IronOnline. October, 2000. To read a few article about Wayne and GMV Bodybuilding DVDs, please click here. Click here to see Wayne's Story on the George Negus TV show in A-1084DVD. 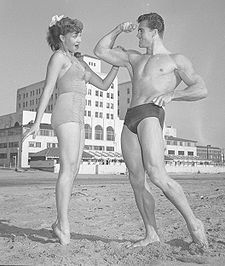 *On Sept. 3, 2007 there was a ceremony at Muscle Beach to create a "Walk of Fame" for Body Builders. They gave Mickey Hargitay a Tribute on Labor Day with a plaque on the "new" Walk of Fame". They will also honor Jack LaLanne with a Lifetime Achievement Award. Please click here for the 2007 Ironage Reunion and Chuck Sipes Award to Roland Kickinger GMV-674DVD. Please click here to see the last known public footage of the late JOE GOLD when he attended the Bill Pearl Iron Man Luncheon in Santa Monica, 2003. This footage is part of the BILL PEARL DVD, GMV-659DVD.